I ran across this website this afternoon, and to my surprise, it has a ton of wealth making opportunities on it. Some are free to join, some have free videos, and some are just downright outstanding. Just thought to let you know about it. Here is the link, check it out yourself, and tell me what you think. Are you trying to get your website out there for everyone to see? We have the best tips out there on marketing your website. Follow our helpful pointers and you will see your Internet business grow to be bigger than you ever thought possible. Read on to see how easy it is. When you work at home it’s just you, no one there to tell you to get to work, no one there to see if you stay in pj’s and watch cartoons all day lol. This infographic by BellVue, will help make things a little easier for you to get UP on those days you want to stay DOWN. 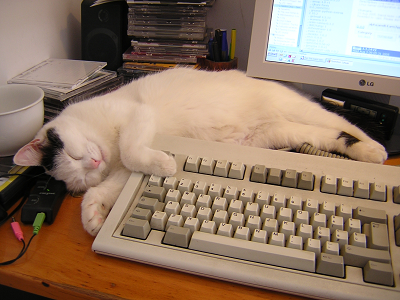 I know it is pretty low using a cat in a blog post photo but I guess that is where things are going. If you can't beat them join them. I just did a blog post on 11 Habits of Successful Work at Home Entrepreneurs. I actually came up with with good advice if you don't say so. Now I have to take my own good advice and start applying these principles. Have a look and let me know what you think.